The Greenville Fairfield Township Cemetery north of New Bedford was the former Whittington Cemetery. The land was donated by John and Jane Whittington sometime in 1850. 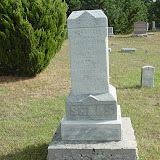 In the 1920's it was changed to the Greenville Fairfield cemetery. ~ Kathy (from a note on file at the Historical Society).